Please try to follow these brief instructions to hear the audio. Please note that these features work best using the latest versions of Google Chrome , Internet Explorer or Firefox browsers. 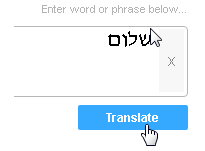 Enter your word and click the blue "Translate" button. Please let us know if this works for you. If you continue to have trouble, please Contact Us with specifics so we can help you through.